Liverpool's 19-year-old right back Trent Alexander-Arnold received a surprise call-up for England as manager Gareth Southgate put his faith in youth with his final 23-man squad for next month's World Cup. Chelsea's out-on-loan midfielder Ruben Loftus-Cheek, 22, was also given a seat on the plane to Russia after impressing for Crystal Palace this season. While Chelsea skipper Gary Cahill, whose place had been in doubt, also makes the trip east, experienced goalkeeper Joe Hart and Arsenal midfielder Jack Wilshere were both omitted from the squad announced on Wednesday. Southgate broke with convention by declining to name a provisional 30-man squad, opting instead to select his preferred 23 well before FIFA's June 4 deadline. He did, however, leave the door slightly ajar for five players placed on a standby list. Former national under-21s manager Southgate has championed young players since taking over in the wake of Sam Allardyce's dismissal and has named one of the most callow England squads ever to travel to a major tournament. 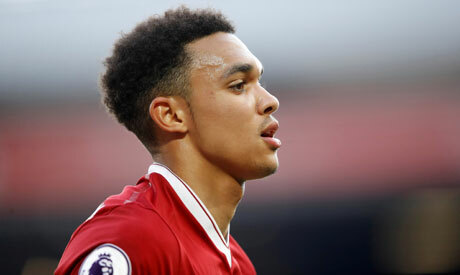 The uncapped Alexander-Arnold is the youngest after an amazing breakthrough season with Liverpool, which will culminate in next week's Champions League final against Real Madrid. Apart from Cahill, there were a few other players breathing a sigh of relief. Among them is Arsenal's Danny Welbeck, who missed a chunk of the season through injury but was named alongside Harry Kane, Jamie Vardy and Marcus Rashford in the striking department. Left back Danny Rose was also selected despite playing only 10 Premier League games for Tottenham Hotspur this season. With Hart's England days now apparently over after being his country's senior keeper for the past three tournaments, Everton's Jordan Pickford is expected to start in goal in England's opening match against Tunisia on June 18. He will be joined by Jack Butland, whose domestic season ended in Premier League relegation with Stoke City, and Burnley's Nick Pope. Southgate named four out-and-out strikers and, with Raheem Sterling, Dele Alli and Jesse Lingard all named as midfielders, the squad appears to have plentiful goalscoring options. In Brazil four years ago England managed two goals in three group games and crashed out before the knockout phase. There was no place for Liverpool's Adam Lallana, though he is one of the players on standby, along with Burnley keeper Tom Heaton, Burnley defender James Tarkowski, Bournemouth's 21-year-old midfielder Lewis Cook and Jake Livermore. England play friendlies against Nigeria and Costa Rica on June 2 and June 7 before leaving for Russia on June 12. Defenders: John Stones (Manchester City), Harry Maguire (Leicester City), Phil Jones (Manchester Utd), Kyle Walker (Manchester City), Kieran Trippier (Tottenham Hotspur), Gary Cahill (Chelsea), Ashley Young (Manchester Utd), Danny Rose (Tottenham Hotspur), Trent Alexander-Arnold (Liverpool). Midfielders: Eric Dier (Tottenham Hotspur), Jordan Henderson (Liverpool), Dele Alli (Tottenham Hotspur), Jesse Lingard (Manchester Utd), Raheem Sterling (Manchester City), Ruben Loftus-Cheek (Chelsea), Fabian Delph (Manchester City). Forwards: Harry Kane (Tottenham Hotspur), Jamie Vardy (Leicester City), Marcus Rashford (Manchester Utd), Danny Welbeck (Arsenal).